Caroline Baum had an interesting take on Greenspan's new book "The Age of Turbulence" in Memoir Shows Dangers of Irrational Book Advances. For someone who made headlines with his every utterance -- even if no one could agree on what he had said -- Alan Greenspan offers few newsmaking moments in his eagerly awaited memoir, "The Age of Turbulence". Sure, his criticisms of the Bush administration (for its "out-of-control spending"), Republicans in Congress (they "lost their way," "swapped principle for power" and "ended up with neither") and the Iraq War ("largely about oil") provided weekend fodder for the media. While Greenspan calls his book a detective story, there isn't much in the way of suspense. Greenspan's words are as measured as they were in his communications as Fed chairman. Now as then, they seem designed to create an effect rather than to unveil the wizard behind the curtain. reduced credit standards on subprime mortgage loans, he says, "but I believed then, as now, that the benefits of broadened home ownership are worth the risk." For someone who supposedly believes in the free market, except of course when it comes to the Fed itself, that quite a statement. The criticisms of Bush, the Republican budgets, the war over oil, and his belief in subprime loans all smack of attempts to lay the blame elsewhere for the credit debacle that is about to unfold. More interesting than the book, however, is Greenspan's whirlwind promotion tour of it. On the Today Show Greenspan says U.S. not headed for recession. Former Federal Reserve Chairman Alan Greenspan said on Monday the United States appears set to weather the bursting of a housing bubble without falling into recession. But in a separate interview with CNBC Television, he warned that the Fed has to be careful to avoid stoking inflation with any future policy moves. "It's very clear that the trade-offs between inflation and growth have altered," he said. "The Fed has to be more careful about inflation now than it did when I was chairman." Greenspan, in an interview in the Dutch newspaper NRC Handelsblad on Monday, warned inflation will rise to about 5 percent in Europe and the United States. "The normal inflation level is closer to 5 percent than the current 2 percent," Greenspan said, adding that the 5 percent level fitted an economy with a "paper" standard where the currency is not linked to gold. The memoir has already drawn attention for the comment the Iraq war is "largely about oil." He said on Monday his comments should not be seen as questioning President George W. Bush's emphasis on Saddam Hussein's arsenal as the justification for invading. "I'm not saying that they believed it was about oil. I'm saying, it is about oil and that I believe it was necessary to get Saddam out," he said. After warning about irrational exuberance in 1996, Greenspan embraced the "productivity miracle" and "dotcom revolution" in 1999. Mid-summer of 2000 Greenspan fell in love with his own analysis and was worried about inflation risks. Shortly thereafter the Greenspan Fed embarked on an incredible campaign slashing interest rates to 1% in panic over deflation. Greenspan is now trumping up the idea that credit conditions are like 1998. I talked about this in No Greenspan, Conditions are NOT Like 1998. On May 21,2006 Greenspan said housing prices won't fall nationally. That prompted me to write Greenspan Predicts Housing Bust. History shows Greenspan was worried about Y2K problems (slashing interest rates and adding fuel to the dotcom bubble). Y2K went off without even minor glitches. In 2001 Greenspan pleaded with Congress to adopt Bush's $1.35 trillion tax cut. Greenspan's rationale was the government would run huge $5.6 trillion surpluses over the subsequent decade after the cuts. It's right here in the Testimony of Chairman Alan Greenspan Before the Committee on the Budget, U.S. Senate January 25, 2001. The key factor driving the cumulative upward revisions in the budget picture in recent years has been the extraordinary pickup in the growth of labor productivity experienced in this country since the mid-1990s. The most recent projections from the OMB indicate that, if current policies remain in place, the total unified surplus will reach $800 billion in fiscal year 2011, including an on-budget surplus of $500 billion. The CBO reportedly will be showing even larger surpluses. The sequence of upward revisions to the budget surplus projections for several years now has reshaped the choices and opportunities before us. Indeed, in almost any credible baseline scenario, short of a major and prolonged economic contraction, the full benefits of debt reduction are now achieved before the end of this decade--a prospect that did not seem likely only a year or even six months ago. Greenspan has been wrong at every critical juncture in his career. So now when Greenspan is warning of inflation just as he was in Summer of 2000, fears should be anything but inflation. But if inflation is the fear, then why is Bernanke on a shock and awe campaign surprising the markets with half point cuts first in the discount rate and second in the Fed Funds rate, during options expiration week in consecutive months? 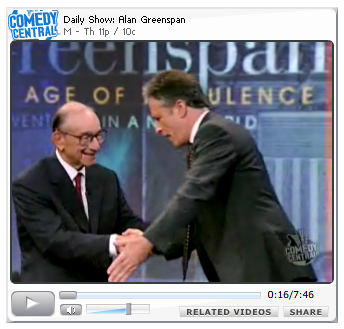 Click here to see Greenspan and Jon Stewart. Kevin Depew on Minyanville had this interesting take on the show. Greenspan: "I've been dealing with these big mathematical models of forecasting the economy, and I'm looking at what's going on in the last few weeks. … If I could figure out a way to determine whether or not people are more fearful or changing to more euphoric, and have a third way of figuring out which of the two things are working, I don't need any of this other stuff... Forecasting 50 years ago was as good or as bad as it is today. And the reason is that human nature hasn't changed. Yes, if only there was a way to model transitions in social mood from euphoric to fearful and from fearful back to euphoric... if only. Greenspan's unwitting acknowledgment that if he could "figure out a way to determine whether or not people are more fearful or changing to more euphoric" then he could throw away his other models is precisely why those models he, and other economists, rely on are powerless at predicting future outcomes. When social mood supports credit expansion, as it has for the better part of two decades, then the kind of central bank policy practiced by Alan Greenspan indeed looks "Maestro"-like. When social mood no longer supports credit expansion, however... well, just ask Japan. What Greenspan is admitting is the Fed has no idea what it's doing. As a result the Fed always seems to be chasing its own tail in a sequence that keeps creating bigger and bigger bubbles. Stewart: When you lower the interest rate and drive money to the stocks, that lowers the return people get on savings in a bank. Greenspan: Yes, indeed. Yes, indeed. Stewart: So they've made a choice -- we would like to favor those who invest in the stock market and not those who invest in the bank; that helps us. Greenspan: That's the way it comes out but that's not the way to think about it. Stewart: It seems to me that we favor investment but we don't favor work. The vast majority of people work and they pay payroll taxes and they use banks. And then there's this whole other world of hedge funds and short betting and...it seems like craps. And they keep saying, "No no no, don't worry about it, it's free market, that's why we live in much bigger houses. But it really isn't, it's the fed, or some other thing, no?" History will not be kind to Greenspan. He was wrong about every critical pronouncement for his entire career and no amount of whitewashing can change that. So forget the book, just play the video. You won't waste $20-$35 bucks and the latter will be far more entertaining.